Jason Sadler's new last name will be "Jason HeadsetDotCom." The 30-year-old founder of IWearYourShirt, who wears sponsored T-shirts for a living, recently held an online auction. Looking to raise cash for his business, Sadler said he would change his last name for all of 2013 to the name of the highest-bidding firm. Sadler said 25 companies participated in the auction, which ended Wednesday. Two bidders -- Headsets.com and PawnUp.com -- battled it out to the very end. Ultimately, San Francisco-based Headsets.com, a seller of headsets for telephones and other gadgets, won with a final bid of $45,500. Sadler said he's excited about his soon-to-be new last name. "It was really interesting to see my idea come together," he said. 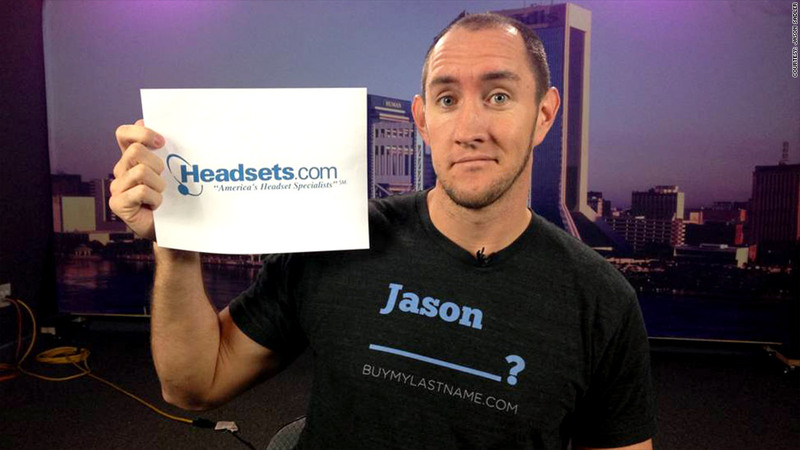 "I'm not nervous, because Jason HeadsetsDotCom will be my new name in 2013, but not for the rest of my life." Headsets.com CEO Mike Faith said Sadler's crazy idea was a perfect fit for his company. "We've done some wacky marketing things ourselves in the past," Faith said. Three years ago, for example, Headsets.com offered free headsets for life to anyone who got a tattoo of the company's name. "It generated a lot of buzz," Faith said. "Six people actually did it." Faith said Sadler's gimmick is a "one-year inexpensive gamble" for Headsets.com, which generates $30 million in sales annually. "The $45,500 we paid to win equates to $900 a week, or $125 a day," Faith said. "That's not expensive for the marketing value we're hoping to get from this." Sadler came up with the auction idea to raise capital for his startup, but said he plans to donate some of the money raised to charity.